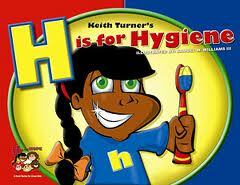 I`mAunty Hygiene and as my name implies, I`m very particularabout personal hygiene. This column is dedicated toall those children who are not really concerned aboutpersonal hygiene. But, I`m quite concerned about youall and would like you to grow up with clean habits.So, I`m going to tell you something every week abouthow to grow up healthy and happy. It`s a lot more fun to play in the mud with your friends than to take it off in the bathroom, isn`t it ? But did you know that bathing and grooming yourself is a lot of fun too ? Try it out just once - isn`t it wonderful to smell fresh, have gleaming white teeth, and lustrous hair ? Let us take a look today at the bad habit of nail biting. Once a child gets into this habit, it is very difficult to break it. But if you are firm about getting rid of this habit, you will surely be able to do it. If you bite your nails while watching television, take up a hobby like painting or needlework. Fingers that are busy won`t have time to be in the mouth ! Many children bite their nails for want of anything better to do. Sometimes they bite because they are bored or nervous. In such cases, try sitting on your hands until the urge goes away. As your nails begin to grow, keep them neatly groomed. Girls can paint them too ( when they are grown-up! ) This way you will think twice before biting and spoiling them. Bad habits take a long time to get rid of, but if you are determined, you will reach your goal. Let me sign off here. See you next week - looking neat and clean of course.